Introduction and Uses: Marigold is one of the most popular annual flowers in India. It is used for garden display as well as for commercial cultivation. These delightful beauties are ideal for cut flowers, especially for making garlands. They can be planted in beds for mass display, in mixed borders, and can also be grown in pots. French Marigolds are compact in habit and flower profusely in singles or doubles. 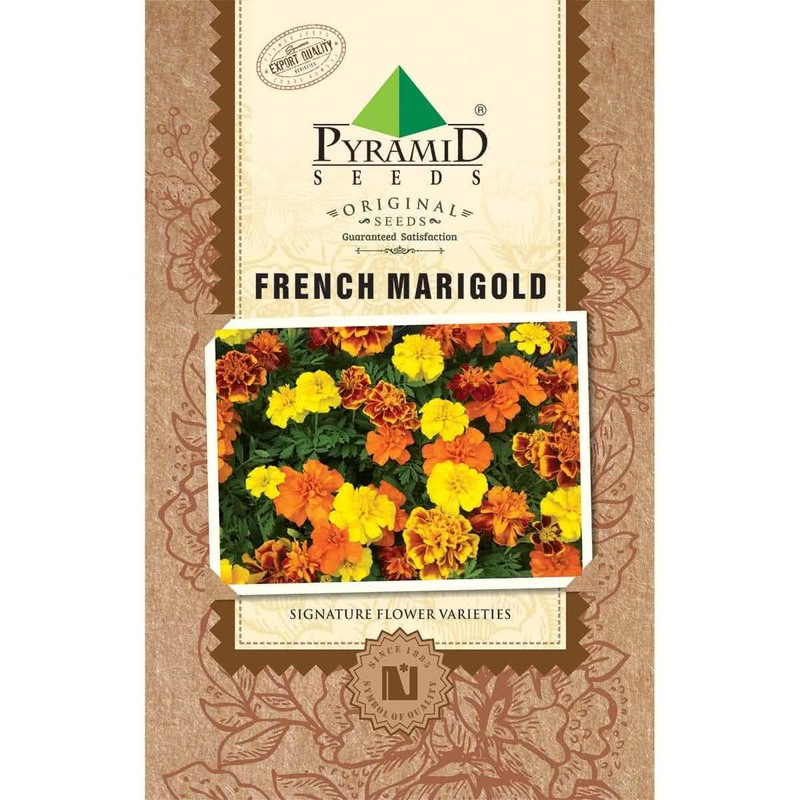 The French marigold is ideal for hanging baskets, window boxes, rockeries, and edgings. When grown in a newly planted shrubbery, they help fill the gaps and add color. The French marigolds are also suitable for planting in drifts and along driveways or paths. Marigolds are grown by transplantation method. The seeds are sown in May-July for monsoon flowering, August-October for winter flowering and February-March for summer flowering. One-month-old seedlings are transplanted in pots or flower beds. Planting Distance: 30 cm apart in flowerbeds or 25 cm pots. Watering: Water the marigold plants twice a week in winters, every alternate day in summers. Provide plenty of water to potted plants as well. 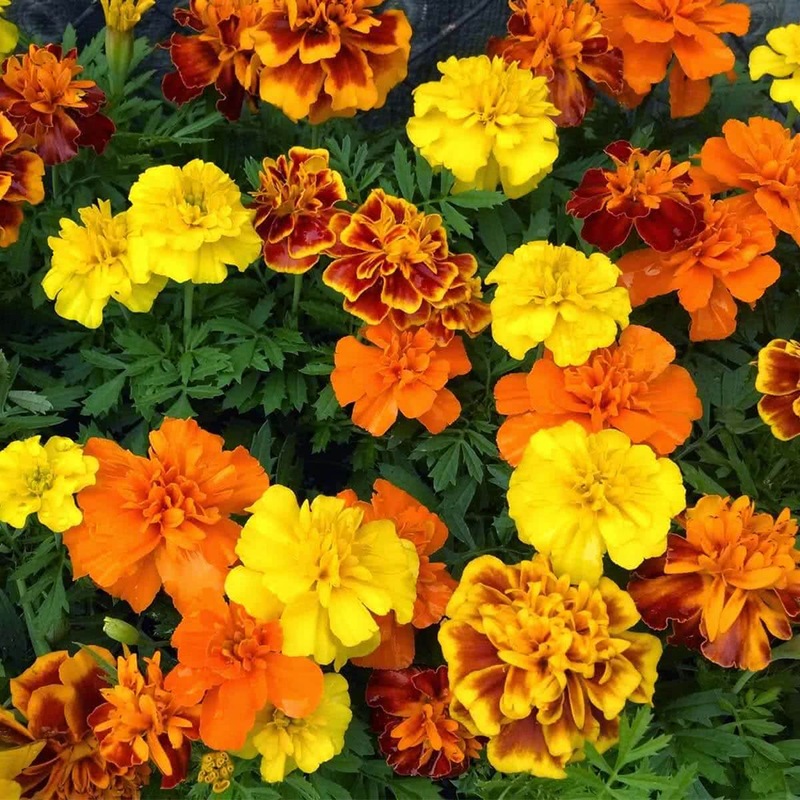 Feeding: French Marigolds perform well in light soil. These should not be given too much manure as they will produce more vegetative (leafy) growth and fewer blooms. Plant care: Marigolds are hardy plants and are rarely attacked by diseases. In poorly drained soil, footrot caused by Phytophthora may occur. Prophylactic spray or drenching with Blitox is helpful in checking the foot rot. Bloom time: 2-2.5 months after sowing of seeds. Pinching: The seedlings tend to produce flower buds at a comparatively young stage. These should be pinched off to obtain bushy and compact growth.